Note: this is the point when I started to "get it"
Driven from Wall St by unusual police violence, Occupy attempted to occupy Union Sq (14th St.) and joined with the "Million Hoodie March" for slain Florida youth, Trayvon Martin. Occupy announced training, which should prepare occupiers for continued head bashing which probably won't knock any sense into their heads. Occupiers must occupy themselves and attempt democratically create long-term goals that a significant proportion can support if they plan to be anything but human Piñatas for the capital beast -- which is at least 50% of any financial capital, not 1% as they apparently believe. 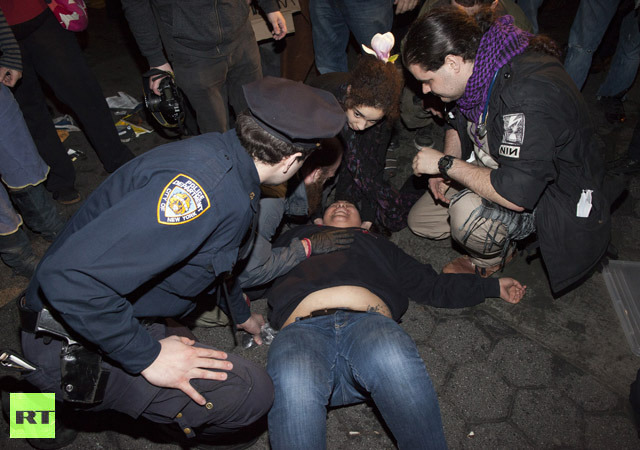 Here a 1% cop shows sympathy for a protester with head trauma.